Search all Carmel Highlands Luxury Real Estate for sale including luxury homes and condos for sale on the Monterey County MLS on one easy to use website. We use only the most accurate "official" Carmel Highlands, CA MLS Data to update this website every 15 minutes. When you think of the Carmel, CA and the Carmel Highlands, you think of luxury…magnificent waterfront views, spectacular sunsets, living an incredible lifestyle in luxurious real estate. Many of the towns on the Monterey Peninsula are synonymous with living the luxury lifestyle…Carmel-by-the-Sea…Pebble Beach… The reality is the entire coastal area around Monterey is synonymous with luxury. Those of us who live and vacation here regularly are spoiled by incredible weather year round, beautiful scenery, the top golf courses in the country, the best restaurants and shopping opportunities, and the most luxurious real estate arguably in the world! The Carmel Highlands is made up of luxury homes both on the waterfront as well as high up on the seaside hills and since this area was developed over a relatively long period of time, there is an eclectic mix of luxury homes here. It really depends on what the buyer is looking for and what their definition of luxury is. Carmel Highlands has 1500 square foot luxury homes with incredible ocean views, incredible contemporary oceanfront luxury homes, and even more traditional homes equipped with all the luxuries and modern day conveniences one might want. Whatever your definition of luxury is, the Carmel Highlands has it and the Monterey Peninsula Home Team can help you find it. The latest luxury homes offered for sale in the Carmel Highlands, CA are listed below and updated regularly. 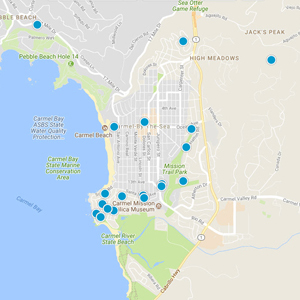 For a full list of every luxury home available in Carmel, CA or the Carmel Highlands, you can build an advanced search or you can contact us and we can do it for you. We also have prepared the following pages for you to look over: Monterey Peninsula Luxury Real Estate, Pacific Grove Luxury Real Estate, Pebble Beach Luxury Real Estate and Monterey Luxury Real Estate.